Photo (perhaps 1945) by Alexander Archer. For a page of related photos, click here. Rabbi Abba Hillel Silver was a life-long champion of the cause of a Jewish homeland in Palestine. He was more than a leader skilled in planning strategy and working at the highest levels; his powerful speeches were heard by tens of thousands. He would inspire Zionist rallies, appeal to non-Zionist Jews to accept the movement's goals, and appear before Christian groups to win their support. For more on his Zionist activities as a boy, click here. For some images of him in the 1945-47 period, click here. This page will present only three episodes in his lifetime of Zionist activities. None of them were available on the web in 1998 when this site was created. 1943 - Abba Hillel Silver wrests leadership of American Zionism from Stephen S. Wise to lead it more aggressively. 1947 - His leadership that culminated in the U.N. partition resolution that established the State of Israel. 1948 - Silver confronts President Harry Truman. In May 1942 the Biltmore Program showed that Zionists were accepting Abba Hillel Silver's leadership, not Wise's. See endnote: the Biltmore Program. Then in July 1943, at a large and contentious American Jewish Conference meeting in New York's Waldorf-Astoria hotel, Abba Hillel Silver rose to the leadership of American Zionism and with the support of David Ben Gurion displaced Stephen S. Wise. Two essays on the web document this. Abba Hillel Silver's Rise to Zionist Leadership by Rafael Medoff, Ph.D., Director of the David Wyman Institute for Holocaust Studies appeared in Jewish newspapers and on their websites in July 2003, the 60th anniversary of the event. Clash of the Titans: Stephen S. Wise vs. Abba Hillel Silver, a four part essay by Kenneth Libo Ph.D. and Michael Skakun appeared on the website of the Center for Jewish History in 2004. To read the essay on the CJH site, the links are Part One, Part Two, Part Three and Part Four. To read the entire essay on our pages, click here. These articles are well-written, carefully researched descriptions of a turning point in modern Jewish history. Medoff focuses on the change in leadership; Libo-Skakun covers a much longer time span. We suggest reading them both. Although Wise would be listed with Silver as a co-chair, that was a gesture. Decisions were made by Silver only. The years of contention between the two had ended. Silver and Ben Gurion would work together to make history. See endnote: Wise and Silver. The left photo above shows the essential moment in Abba Hillel Silver's work to establish the State of Israel. 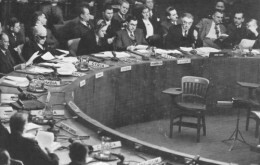 As chairman of the Jewish Agency for Palestine he is at the United Nations in November 1947, seated in the first row. At his right is the Soviet Foreign Minister Andrea Gromyko. 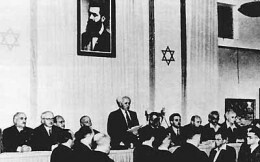 Seated behind him are Emanuel Neumann, Golda Meir and Moshe Sharett. Only David Ben Gurion, who shared leadership with Silver, is missing. He was delayed in Israel and for that reason Silver (introduced as Dr. Silver) presented the case. What is being discussed will become U.N. Resolution 181, a plan for Palestine to be partitioned into an Arab state and one controlled by Jews. with Jerusalem being jointly controlled. (Nearly 60 years later, "two state solutions" are still being discussed.) To read the resolution, see how each nation voted and hear the votes being cast, click here. Those familiar with Silver's eloquence can imagine what happened. He presented the case for Israel so movingly and effectively that the vote passed. Then we see the photo on the right: a jubilant Silver being embraced by Moshe Sharett. Not so. It was not one dramatic day. In 1947 the U.N. investigated and deliberated not for a day or a week; its meetings spanned seven months, from May through November. Jewish representatives were allowed to sit in on most of these meetings. During the U.N.'s discussions and for years before there had been much work outside the U.N.: writing, speaking to huge rallies and conventions, meeting in small groups and one-on-one, garnering the support of people everywhere - politicians and the public, Jews and Christians. The Zionist delegation, including Abba Hillel Silver, stayed in a hotel in New York. Silver would live in New York and spend his days there or in Washington, with many trips home to Cleveland for the weekend. He was completely focused on this process, thanks to The Temple having granted him an indefinite leave. His energy and drive were invaluable, his replacement of an ailing. less forceful Stephen S. Wise most timely, and his close working relationship with David Ben Gurion very effective. It must have been the best of times, for he was working to realize a lifelong dream. The Spielberg Jewish Film Archive has made available much of his presentation before the Ad Hoc Political Committee of the General Assembly on May 8, 1947. The clip in incorrectly titled Day of Decision. Silver, introduced as Dr, Silver, can be heard starting at 2:34 Watch the video. Truman had them ushered out of the Oval Office, and said to his staff. "I've had it with those hotheads. Don't ever admit them again, and what's more, I also never want to hear the word Palestine mentioned again." Truman had developed an aversion to Rabbi Silver, and once remarked that many of the problems of Palestine were due to terror and Silver." Truman and the American Zionist leaders had a tense relationship, with Harry Truman coming to resent their "pressure" tactics. Yet, at the end Truman supported partition and had to counter our State Department's desire to do nothing that might endanger U.S. oil interests. Truman had recognized the strong public opinion in favor of U.S. support of the new nation. birth of the State of Israel. See also a chronology on the pages of the Truman Presidential Library. 1953 - The Canadian Jewish Chronicle February 29, 1953 issue. 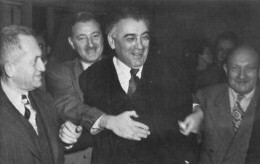 Emanuel Neumann and Silver were childhood friends on New York's Lower East Side and worked together at the highest levels of Zionist leadership. Neumann describes Silver's rise in leadership in the 1940s and what can only be described as struggles, for years, plotting and leading a course that would be successful. The book was the outcome of a conference at Brandeis University, supported by Raphael Silver. Regrettably the slim volume was priced at $130 and so has had little exposure. In 2008 parts were put on the web in the Google® books online library. Click here. "Abba Hillel Silver and David Ben-Gurion: A Diaspora Leader Challenges the Revered Status of the "Founding Father"
A carefully researched description in the differences between Silver and Ben Gurion, how Silver was removed from leadership roles in the US and World Zionist. and how, as Silver adjusted his views and behavior, he and Ben Gurion once again has a close, cordial relationship. David Ben Gurion, perhaps seeing Silver as a political rival, at the first opportunity that presented itself displaced Abba Hillel Silver, his partner in the struggle for Statehood, from Zionist leadership. They would reconcile many years later. Abba Hillel Silver would return to Cleveland, to his Temple, where he would lead his congregation, speak and write until his sudden death on November 28, 1963. Stephen Samuel Wise died in April 1949, having lived to see the founding of the State of Israel. A two state solution is still being discussed to this day.